This autumn THHN celebrated another milestone: providing its 600th family with a memory-making holiday. This just goes to show what happens when a small group of people dream big. And we’re working hard to raise money to help the next 600 families. A massive thank you to all involved in the work of THHN. King Canute, eat your heart out! Babbacombe Cliff Railway and Three Degrees West staged Last Team Standing on Oddicombe Beach on 1 October with funds going to THHN. Each team spent 40 minutes building a sandy mound before standing on it until the incoming tide washed it away. The team holding out the longest were proclaimed the winners. Ever up for a challenge, we entered our own team. Team THHN found themselves in the water after 90 minutes and took third place. The winners were the Wacky Builders. A big thank you to all involved in organising the event, Bays Brewery for sponsoring the event, all the participating teams and the THHN volunteers who took part and helped at our gazebo. If you’re sorting through your kids’ toys, games, books, DVD’s and clothes in the run-up to Christmas, please think of us. After a busy Summer our THHN Memory Makers Children’s Shop in St Marychurch Precinct is looking for donations. The shop sells pre-loved children’s items to raise money for THHN. On 11 October, THHN director Martin Brook visited St Cuthbert Mayne School, Torquay, to make a presentation about THHN and receive a cheque for an eye-popping £875 for the charity. This huge sum was raised by just one tutor group, 11CJG, who together with their form tutor Mr Gibson arranged a variety of events for charity. These included running a marathon of 26 miles (1 mile each), naming a giant teddy bear and even involving South West sporting clubs and local restaurants who have donated tickets and vouchers for auction. 11CJG have been great supporters of local charities since starting at St Cuthbert Mayne in 2012. Since then, the tutor group have raised almost £2,500 for charitable causes. A huge heartfelt thank you to the amazing Dave Hanbury and his fantastic team at Hanbury’s Famous Fish and Chips, who landed a whopping catch for THHN earlier this week, by holding a super fundraising evening and raising £1,400! A special thank you to the super Krankees, Anais and Abi, for providing such high-quality entertainment! And of course a big thank you to all of the super VIP guests who came along and supported the event. City to Sea 2017 is now open for entries and the first runners have already signed up. It will be held on Sunday, 3 September 2017 and, as ever, there will be the chance to walk or run the marathon or run the ultra. This time the ultra will be a shorter 34 miles, making it more suitable for runners tackling their first event of this type. Both the marathon and ultra will start at Exeter Riverside and end on Babbacombe Downs, where there will once again be a Festival of Fun for all the family and where all the runners will receive a t-shirt, medal and free fish and chips from Hanbury’s Famous Fish and Chips. Glendower B&B held a karaoke night recently and raised a fantastic £130 for THHN. Glendower is a much-valued accommodation for the charity, so we are doubly grateful for their amazing support. 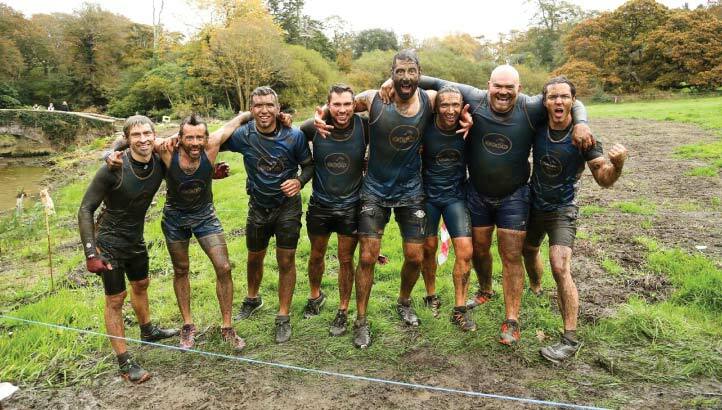 THHN founder Luke Tillen and seven other diehards endured a day of pain and a lot of mud – all to raise money for our great little charity. On Saturday, 29 October, the THHN Titans, led by Glen Bevan, took part in the 11-mile assault course known as the Kernow Killer and understood how it got its name! They completed more than 50 obstacles in an unforgiving Cornish landscape, climbing, scrambling, wading and swimming their way to the finishing line. “The courage and teamwork displayed on the day was simply incredible,” said Luke. The THHN Memory Makers Children’s Charity Shop has a beautiful new carpet, thanks to Swift Carpets and Flooring who donated and fitted it completely free of charge. We are so grateful to them for their support.